This story goes way, way back in my life, so here are a few facts that help set the stage for the miracle I’m about to tell you about. This is a real picture from my real life. Just a regular day. These choices are not cultural, as you can tell by the normally dressed kid next to me. AND this was before cell phones and people carrying cameras in their pockets at all times. Some teacher went out of her way to immortalize this outfit. When I moved to the US for my last year of HS I discovered Big & Tall, the mens plus size store… that helped for a while. When I discovered Lane Bryant (LB) the heavens opened and the angels sang. I was so thrilled, in fact that I got a part time job there, not because I needed the money, but because I wanted to take advantage of the employee discount. The money I made there rarely, if ever, left the store. This is where the rest of this story really gets going. When I first started working for LB, I was in the middle of one of my more successful diet attempts. I had already lost a fairly significant amount of weight and expected that this was a trend that would continue. Armed with a shrinking body and first hand access to the best clearance PLUS employee discount deals to be had, I started buying any clothing I liked (keep in mind that clothes in or near my size was a newly discovered luxury for me), even thought it didn’t necessarily fit at the time that I purchased it. 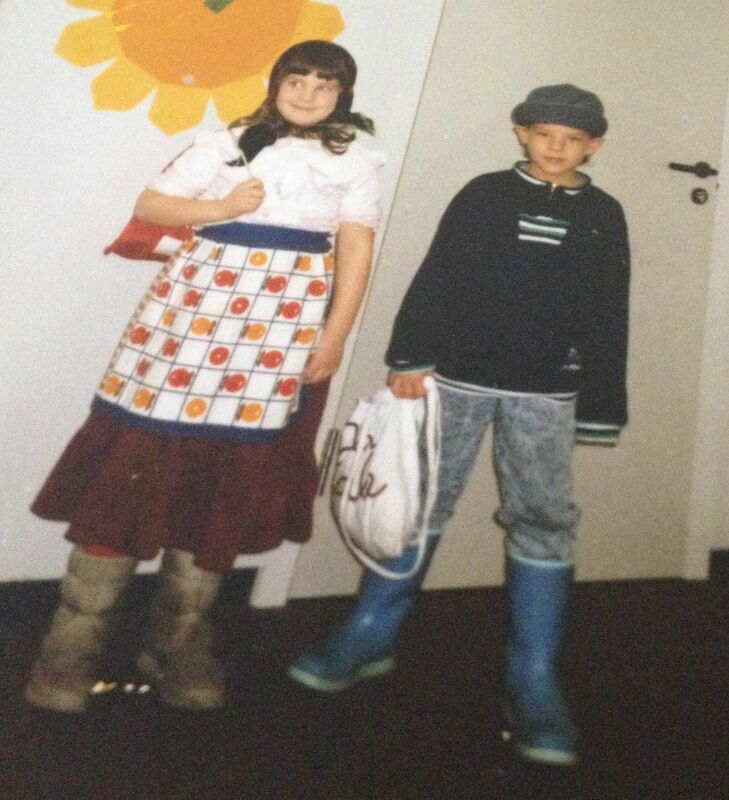 These clothes were aspirational. They were like promises to myself, that I was committed to shrinking. To investing in the future. To doing whatever it would take to make sure those aspirational clothes were not wasted. SO who wants to put money on what happens next? You probably guessed it… the clothes were definitely wasted. They didn’t become inspiration, they became a source of shame. Money wasted. **Willpower** defeated (spoiler alert, I no longer believe in the relationship between willpower and my ability to manipulate the size of my body). It has taken me several years of hard work, but nowadays I recognize the lie of this “deferred happiness.” The false belief that happiness is somewhere in the future, when I finally [fill blank] (examples: lose weight, get a degree, find a partner, get my dream job, make more money, the list goes on and on). I don’t want to give away the end of this story about my closet or anything, but I can’t wait to the end to tell you that happiness doesn’t come from reaching whatever arbitrary goal you, or somebody else set for you. There will ALWAYS be just one more thing you have to do before you can finally be happy. Before you are finally ENOUGH. Here’s the truth: if you can’t be happy RIGHT NOW, right where you are, exactly the way you are, if you can’t see that you are already perfect, even if you never fit into your jeans from HS again, you will NEVER FIND PEACE. Let me say that again: you are ALREADY PERFECT and so am I! I digress. After more than a decade of continuously adding to my collection and never getting rid of anything, because, hey, all it takes one good diet before I will need those clothes again, I had filled so many closets and boxes and suitcases (with space saver vacuum bags) to the absolute gills, that I had to convert a whole bedroom into a new closet/dressing room with rolling racks. I know, RIGHT?!? It’s TOTALLY getting ridiculous. SO I say to myself:”self” I say “we don’t need all of these clothes anymore” and the proverbial meltdown ensues. I mean, what in the actual F**K is the matter with me? They are JUST clothes. Clothes that don’t fit. Some of them have not seen the light of day in YEARS and there are REAL TEARS at the mere THOUGHT of letting them go. At my next appointment with CZB (aka my therapist extraordinaire), I didn’t really feel like I had anything to talk about, so I casually mentioned that I was frustrated with the the clutter and my inability to release my iron grip. She always knows when something isn’t really casual banter and dragged my real, ugly-cry feelings out of me. We processed through some of my well known themes, like letting go, and fairness, and not enough. She reminded me that I should be cutting my losses and stop throwing more time/money/energy after bad. She told me that I wasn’t allowed to say “BUT” for the rest of the session (because I am a master reasoner/arguer and have a reBUTtal for EVERYTHING). I was reminded that I have to let go of them EVENTUALLY (not that I’m near death, but you can’t take your possessions with you). I know that it does not diminish me as a person to let them go. I absorbed that it does not serve me to continue to beat myself up for something that seemed like the right thing to do before I learned about the alternative. Learning and relating to theories has always been the easy part, but taking action and putting those theories into practice is incredibly difficult for me. How do I keep from forgetting my lessons and freaking out when I am actually faced with the task at hand. So CZB helped me with a mantra, which I fleshed out a little, wrote it down, kept on my desk and read to myself each time I looked up, until it felt comfortable. 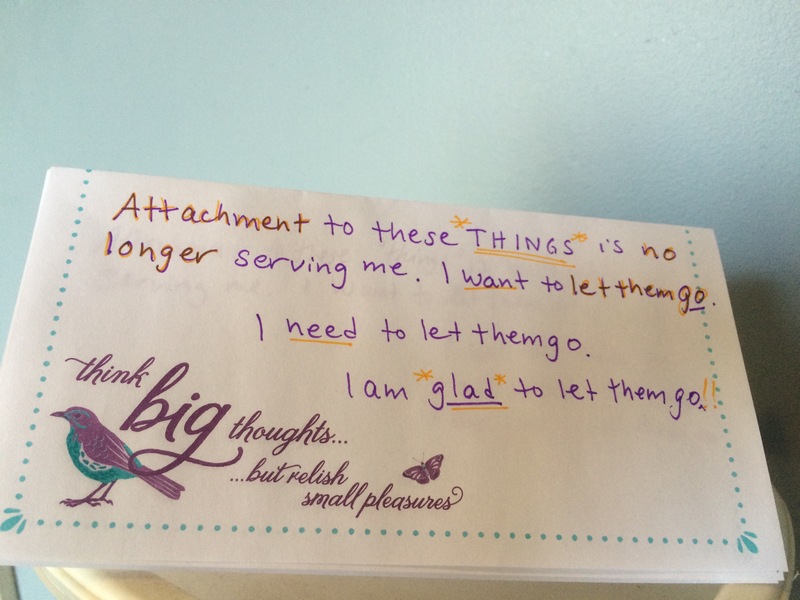 Attachment to these THINGS is no longer serving me. I need to let them go. I permitted myself all the time I felt I needed (because force always has the opposite outcome), but the more I thought about it, the more excited I actually got about getting this task done. I’m hoping to start a trend. 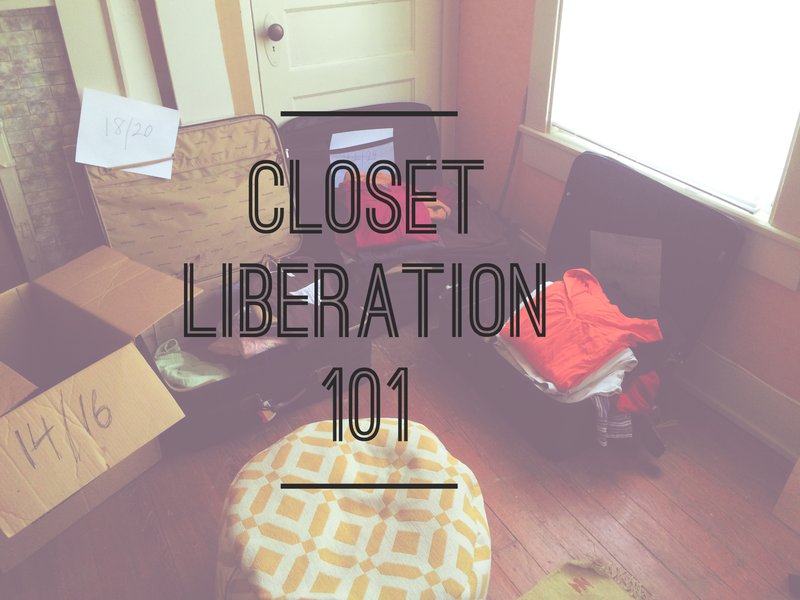 I sorted my clothes by size, so I can give RIGHT size clothes to other women who need to liberate THEIR closets and they can give their clothes to more other women times infinity. And even if this isn’t the beginning of some magical chain reaction, I’m pretty freaking pleased with myself. There is magic in the air, friends. And now that I’ve made space, there’s room for more of that magic in my life. This entry was posted in Uncategorized and tagged aspirational clothes, closet liberation, happiness, magic, plus size clothing, recovery. Bookmark the permalink.